Yun Eun Hye has earned the envy of women everywhere, after being showered with adorable kisses by JYJ’s Park Yoo Chun. On January 2’s broadcast of MBC’s I Miss You, Lee Soo Yeon (Yun Eun Hye) starts to find out more information concerning the people around her. In an attempt to forget about all her troubles, she tells Han Jung Woo (Park Yoo Chun) that she went to buy yarn to knit. Hoping that he can be of some help, Han Jung Woo cups Lee Soo Yeon’s face in his hands and proceeds to kiss her three times, mentioning, ‘ddukbokki,’ ‘soondae,’ and ‘cider’ three of Lee Soo Yeon’s favorite things. Successfully distracting Lee Soo Yeon from her problems, Han Jung Woo then pulled out her childhood diary and recited, “The raindrops told me that I like you,” embarrassing Lee Soo Yeon in the process. Meanwhile, in the same episode, Han Jung Woo finds out about the true identity of Harry Borrison (Yoo Seung Ho), who bursts into painful tears after finding out that his mother is alive, but cannot recognize her own son. Jung Woo (played by JYJ’s Yoo Chun) kisses Soo Yeon (played by Yoon Eun Hye). In the episode of MBC TV’s drama series Missing You that aired on January 2, Jung Woo visits Soo Yeon’s shop. 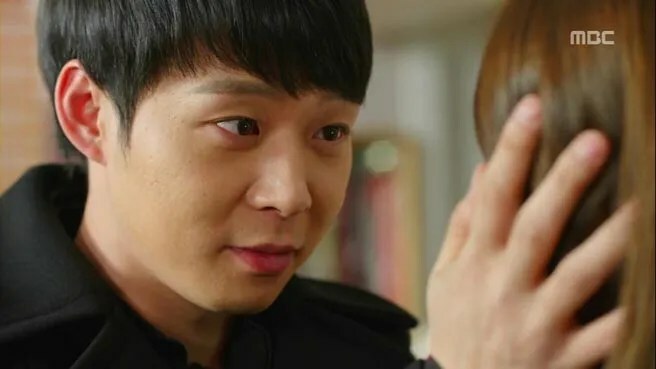 Jung Woo takes out a love letter he received from Soo Yeon in the past and says, “The raindrop told me that I like you.” Feeling embarrassed, Soo Yeon tries to take it away from him. 2012 was the year of actor Park Yoo Chun. Counting his past awards at KBS in 2010 for “Sungkyunkwan Scandal” and at MBC in 2011 for “Miss Ripley,” this means that Park Yoo Chun has won awards from all three main broadcasting agencies. It was later revealed that despite extreme fatigue, Park Yoo Chun was cheerful throughout the shoot.